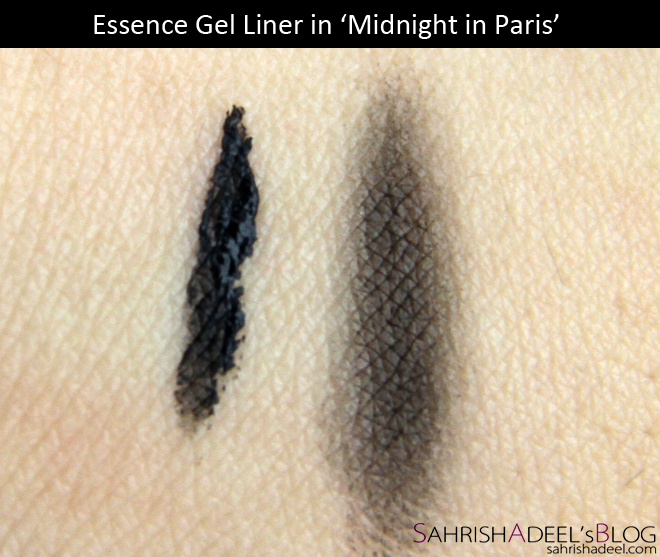 Essence Gel Liner in 'Midnight in Paris' - Review & Swatches | Sahrish Adeel - Malaysia based Pakistani Beauty & Lifestyle Blogger! On my trip to Pakistan this time, I had a wishlist to try some new products. I bought Essence's products along with a bunch of other beauties that you saw in my haul post. I was really excited to try this gel liner but when a product comes with such affordable price tag, it scares me a bit especially eye makeup products. 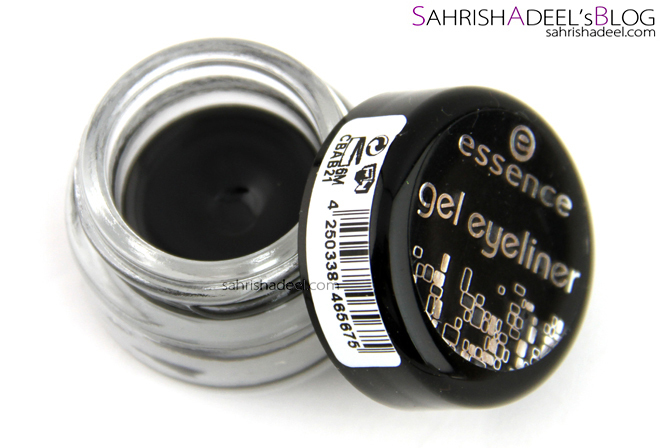 This gel liner comes in a transparent glass pot with a black plastic screw lid. The formula has a creamy consistency. It contains 3g of product and comes in a few shades. 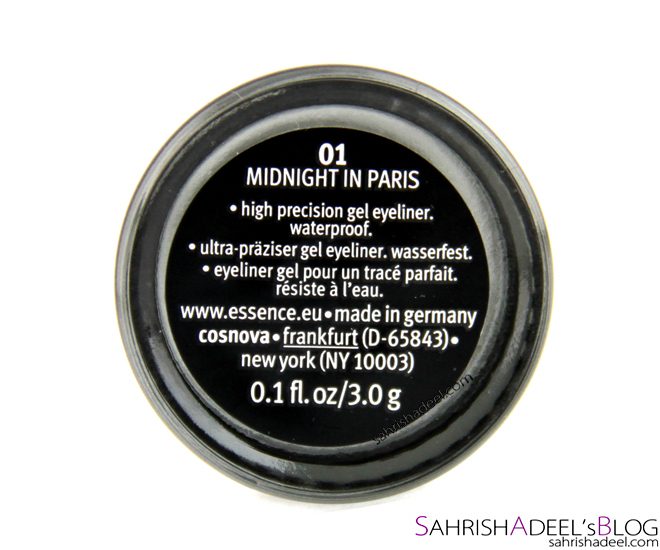 Shade I am reviewing today is Midnight in Paris. Swatches have been taken without a primer underneath. Left side is to show the consistency and the right side is to show how it looks when smudged to create a smokey effect. On the eye, I want to show how it looks when dries, how fines the edges can be and how it looks on the waterline. I have heard rave reviews about this product and I finally managed to get my hand on this on my recent trip to Pakistan. Let's see how I found this product. Glass pot has a really good quality but the plastic cap does not look really sturdy and it feel like it will break or may let air into the pot. I hope I am wrong as I have been using it for a few days now and nothing happened so far. I will update this post if something goes wrong in future. I am really impressed with the formula, it is creamy but not too thick. It glides onto the skin really smoothly and you can create a smooth edge with it. The pointy edges totally depend on the brush you are using but I have got really good results using Kryolan's eye liner brush that has a very fine tip. It also dries quickly giving matte finish and until or unless you really rub your eyes, it won't budge throughout the day. It is highly water/sweat resistant so if you splash your face with water or accidentally meets the rain, it is not going to run down on your face. Just pat it with a tissue and you are good to go. Not to forget, it is tear resistant as well, so good for emotional occasions like weddings and farewell parties. I won't call it a waterproof product because once it is super wet, you can smudge it and for me waterproof products don't do that. 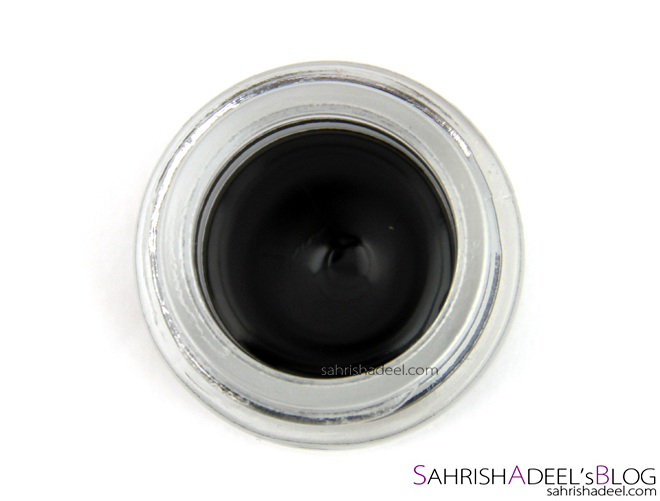 Staying power for this gel liner is just amazing, it will not tone down or smudge throughout the day, for me, about 12 hours and more. I have used it without any primer on my oily lids and it has stayed throughout the day without shifting to the crease line. If you want to remove it, you can either remove it with a cleanser first or just wash your face with your regular face wash and then remove the remaining with a cleanser, saves time. Now comes a negative point, it irritate my eyes when I apply it onto the waterline. I have used Maybelline's Gel Liner on my waterline and that never irritated my eyes. May be the price has to do something with this because Essence's gel liner costs almost half of the Maybelline one. 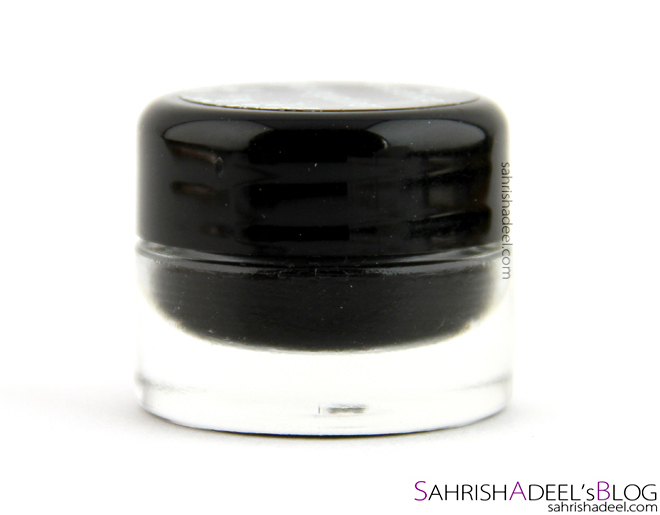 This gel liner has an amazing value for money, I mean just amazing. Overall, I am super in love with this gel liner. I could not ask for more in this price. Since it irritates my eyes, I won't be applying it on m waterline anymore. Does not smudge or tone down throughout the day even without a primer. Irritates my eyes when applied onto the waterline. The cap should be unbreakable. 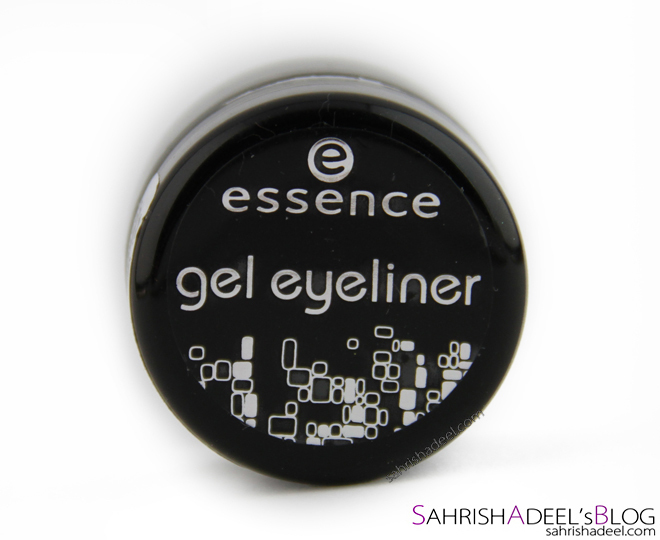 Essence's Gel Liner costs PKR 460 and you can find it in stores that carry makeup all across Pakistan. In Malaysia, it costs RM 15.90 and it available in all drugstores. I think this brand is available in most countries now. Have you tried this gel liner yet? How did you find the formula? More reviews on gel liners.